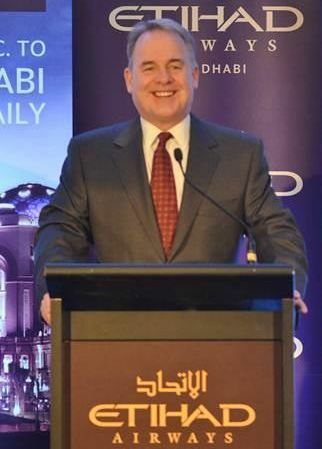 The introduction by Etihad Airways of a daily Abu Dhabi – Washington Dulles flight gave the opportunity for the airline's President and Chief Executive Officer, James Hogan, to address the International Aviation Club in its home city. COMMENT this week is a report on what he had to say. Mr Hogan (57) is an Australian and prior to his present position (appointed September 2006) held a similar post at Gulf Air in nearby Bahrain. James Hogan began his career in 1975 at Ansett Airlines, and subsequently held senior positions with the then British Midland Airways, Hertz and Forte Hotels. Mr Hogan said that Etihad Airways’ unique business model, which is a combination of organic growth, code-shares and minority equity investments, was proving very effective in building passenger numbers, revenue and profit for all its partners. “The traditional airline alliances have evolved into slow-to-respond, bureaucratic organisations which struggle to deliver added value to their member airlines, many of which are no longer compatible with each other. If we look at the consolidation currently occurring throughout the airline industry, we are also seeing more fragmentation within the alliances. This is going to continue as members seek ways to operate profitably in a very competitive environment with high fuel costs and generally slower global economic growth. This month we will report our strongest ever first quarter results. Our codeshare and equity partners have made a major contribution to that financial success”, Mr Hogan said. Etihad Airways owns 29% of airberlin, 40% of Air Seychelles, 9%of Virgin Australia and just under three per cent of Aer Lingus. It has 42 code-share relationships around the world. The airline posted a profit of US$42m in 2012 and saw two of its equity partners – airberlin and Air Seychelles – return to profitability, meaning that all five airlines are now in the black. Mr Hogan said that Etihad Airways’ equity alliance of minority shareholdings enabled the airline to enter markets within local foreign investment limits and, therefore, without the complexities, approvals or expense attached to mergers or larger investments. “It is easier, faster and far more cost effective to grow through one-on-one partnerships with established, respected carriers than it is to rely totally on our own resources, and to start from scratch in every market we serve. We have hand-picked like-minded partners with whom we can work collaboratively to build revenue across a broader network and reduce operating costs. We focus on our partners’ profitability as much as our own, because we are not dealing with competing interests. When the five CEOs sit down to make decisions, we have a shared commitment to make things happen”, he said. Mr Hogan said that because Etihad Airways had skin in the game it could go so much further than legacy alliances in thinking innovatively and building relationships that delivered ongoing value. “An example of innovation is the way we are now working with our equity alliance partners to develop ‘centres of excellence’ in which operational and commercial expertise is pooled to deliver best practice across the group. Cooperation includes fleet and engine acquisition, maintenance, recruitment and training. This is real value-add for our equity alliance and I am confident it is the way forward”, Mr Hogan said.